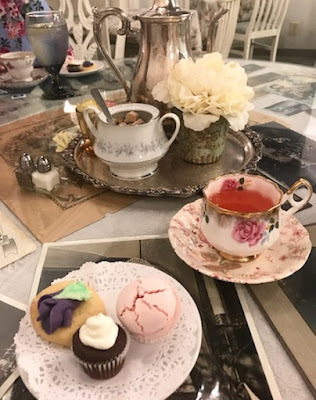 To celebrate Cissy's 11th birthday which is this week, I took my daughter, Molly, and granddaughter, Cissy to a high tea at a local tearoom. Cissy looks so pretty, doesn't she? Besides being pretty on the outside, more importantly, she's pretty on the inside. The Chocolate Angel tea room serves a kid's menu, besides the adult menu, for tea at 3:30. We had our own private area for our tea. Underneath the glass table, they have old fashioned pictures of weddings. The brown things sticking up, are our napkins! The tea room is decorated in a shabby chic style, with different teacups at each place setting, some with matching saucers, and some without. Here is a picture of the three of us ready to enjoy our tea and laugh as only three generations can, with fun memories, and happiness! Here is a picture of our dessert course, with a macaron, mini brownie, and a frosted thumbprint sugar cookie. Cissy chose the Chocolate Angel's Signature White tea for our main course, and then their Toasted Pecan tea, which is pink in color, for our dessert course. We had a wonderful time celebrating this sweet girl's birthday! Thank you for sharing in our joy. Happy Birthday to Cissy! I can't think of a better way to celebrate a birthday than your lovely afternoon tea. I'm also loving your pretty (purple?) dress. Great way to celebrate a birthday with Tea! My birthday is this week also, Friday! What a sweet thing to do for her birthday, Kitty! She is adorable and the three of you look great! Birthday blessings, for Cissy, a special memory for sure. Happy Birthday to your sweet Cissy. You three look like you had a simply wonderful time! Happy Birthday Cissy! Oh how fun to celebrate this auspicious occasion in a beautiful place in grand style......and more precious memories to cherish! Such a lovely photo of you and your daughter and your sweet Cissy. Dear Kitty, that is such a precious birthday for your dear Cissy, and you are making some tremendous memories with your grand children. Sounds like a lovely Tea Room, children's menus and all. White tea has become one of my favorites lately, it's a smooth tea, not too strong. Beautiful photo of the three of you, and yes,Cissy looked beautiful. You can see by her smile that she is sweet on the inside. Happy Birthday to Cissy!Wonderful Tea time!God bless all of you,hugs! What lovely photos and a perfect celebration for your sweet gal! LOVE the teas too...everything was just so fun and sweet. Happy Birthday Cissy! What a special time for the three of you! Oh, if I could have done something like that when I was 11!!! Cissy has grown up before our eyes so quickly. She is beautiful and I am sure as you say beautiful within is true also because I know her grandmother! Kitty, sorry I’m late to the party! Your Cissy is so adorable and looks so happy to be sipping tea with her mom and grandmom. She is a lucky little girl to have you entertain her with such sweet memory making events. Beautiful photo of you, your daughter and Cissy. A wonderful way to celebrate a birthday! Happy Birthday to sweet Cissy! What a blessed time for you beautiful ladies. And Kitty, I simply love your dress! You are such a lovely lady. What a perfect way to celebrate sweet Cissy's 11th birthday! You ALL look so beautiful and your goodies delicious...such a special time together! What a fun way to celebrate her birthday! You can tell by looking at her that she is sweet both inside and out. Kitty, lovely! Three generations of "pretty on the outside, more importantly, pretty on the inside!" You have spent such a wonderful time here at the tea room! You all look so lovely and the food looks delicious. Happy Birthday to Cissy and thanks for sharing. Happy Birthday to Cissy. What a wonderful idea to have tea for the bday celebration. Thanks for sharing at Cooking and Crafting with J&J. Great pictures! My daughters and I love visiting tea rooms and having tea parties of our own too. :-) Enjoy the rest of your week! Kitty, how delightful! Happy Birthday Cissy! Victorian Tea Rooms are so much fun to visit! Happy Birthday Cissy! What a wonderful celebration! Three generations of pretty girls! Happy Birthday, Cissy!! Happy Birthday to your sweet Cissy, Kitty. I love how you celebrated her special day! I’m going to take my granddaughter to tea soon! You are all beautiful and your tea looks delightful! Happy birthday to Cissy. What a lovely way to spend time together, teatime.Looks like a fabulous way to celebrate. Kitty, The little ones sure grow up fast. What a wonderful way to celebrate a birthday. Tea at any time is my take. Thanks for sharing and have a great week. Sylvia D.
This is just wonderful...what a special memory for all of you. Sure wish we had a tearoom near us...I'd definitely take my 12-year old granddaughter:) She would love it. I've always let her drink from the "pretty glasses" at my house trying to teach her to enjoy the good things life has to offer. Now I'm off to look at more of your blog! What a very special Tea Room to take Cissy for her birthday. I remember when we went there together and what a delightful time we had that day, great memories! Hope you are having a great week and thanks so much for sharing with us at Full Plate Thursday. How fun. Happy Birthday. Thanks for linking to Keep In Touch. The sweetest post I have read!! What a lovely group of ladies you are!